Hi, I am not a huge fan of the command-line in general, though after 3 years volunteering (and now interning!) in free software, I am slowly coming round to her charms. “Trying to teach people about command-line is time consuming: doing it badly is an unnecessary drain on resources. I think that one of the solutions is to speed up and simplify command line interface access”. Things that make command-line hard for a dyslexic and/or newbie? One of the biggest problems for me is that I struggle to remember things I have just read on a forum, for example, long enough to write them into the command-line. I do have a poor memory in general, however, as commands and their structure don’t mean much to me, most of the memory tools I use day to day are irrelevant. I guess it’s similar to people still finding mobile numbers hard to remember, we just don’t have the same tools or systems to help. Or like how chess players memory for a board set up seen only for a moment is crippled if the pieces are in “illegal” positions. Their memory is based on a set of rules, and if those rules are broken or changed, not only get confused, their learning capacity is reduced. It’s therefore genuinely hard to remember how things are spelled or what order they go in, when you aren’t sure of the usual rules – for example G referring to gnome and K referring to KDE, all the acronyms and little jokes with which I am now familiar… at first these were a real nightmare. Like trying to write in an alphabet you didn’t know. So, for me, with command line, time is of the essence – even when copying and pasting, the few seconds gap between seeing the forum page and seeing the command-line interface can be a problem, especially in the first year when I was still unsure about which things exactly I needed to paste. Do these problems affect learning? Yes, for me they do. Aside from being hard work, all these little extra worries simply got in the way of my learning – when command-line is cumbersome, learning is harder work too. I am sure most newbies and dyslexics out there understand this issue – but it’s not just an issue for beginners. Trying to teach people about command-line is time consuming: doing it badly is an unnecessary drain on resources. 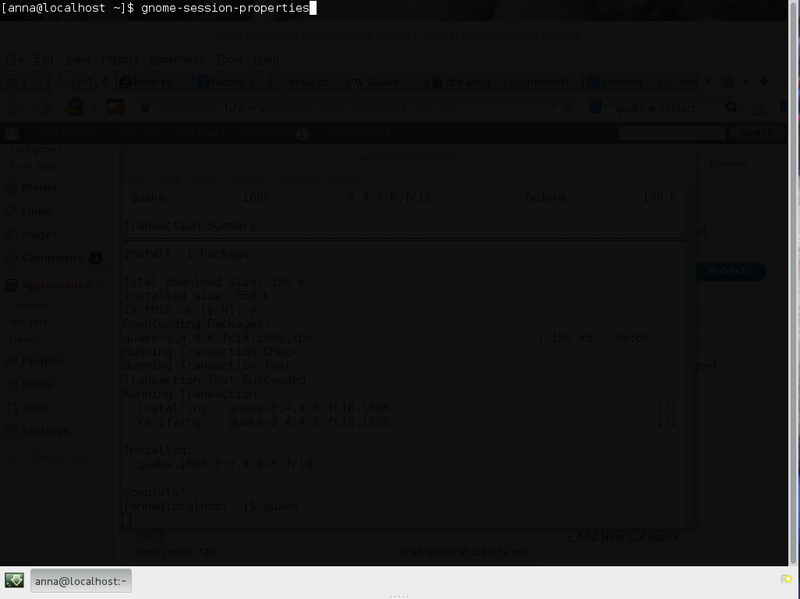 I think that one of the solutions is to speed up and simplify command line interface access. 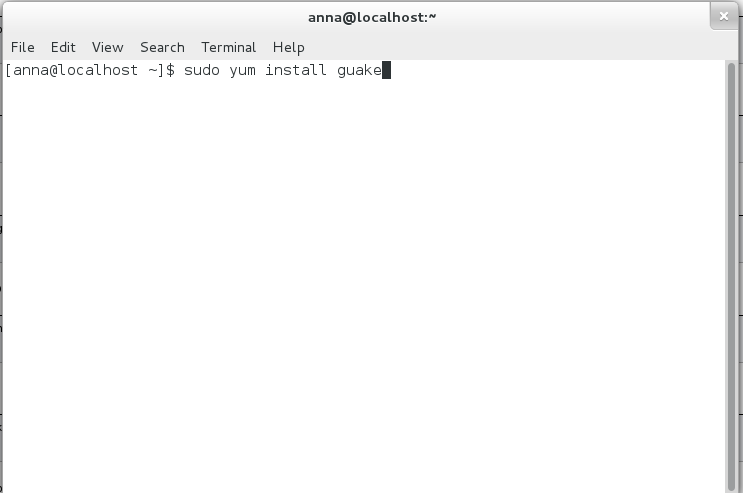 Guake (again, a strange word for people not already into computers) is a command line interface that drops down and retreats again with one keystroke (in my case F12) – it feels a bit like opening a draw. You feel like you are “in” the operating system and not going to another window or application to enter a command – it therefore feels like less of a barrier, feels less alien. Hopping between your command line and your forum help window or IRC help window is very very very simple. 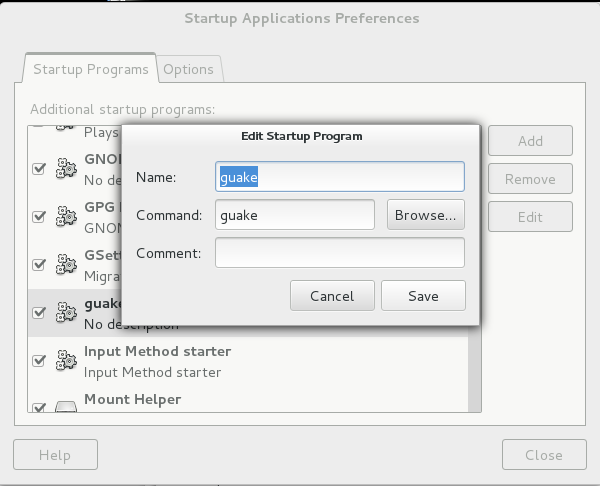 I am aware task hopping in Gnome3 is already quite simple – well this is more simple. It’s almost an invisible action, nothing “moves” on your screen, your help window doesn’t “go away.” You can set the background to be transparent, and because of this you feel, strangely, more supported. Your helper, your Linux lifeline, is still there, holding your hand: you can still see them through the CLI. The feeling of isolation when dealing with an unintelligible task is greatly reduced. It’s also much faster to repeatedly compare what you have done and what you need to do, you can flick between them at lightening speed, checking each letter in your command if you need to, without any whizzing windows, re-sizing and scrolling, or issues with which window is “on top” of the other. The capacity to letter by letter check is really important for people who have not yet learned the lingo (or how to use the tab key). I am sure there are others like Guake by the way, it just happens this is the first one I have used. hit return, type your password (you won’t see letters or stars as you do this) and hit return again. 3) Press y (for yes) and hit enter when asked. 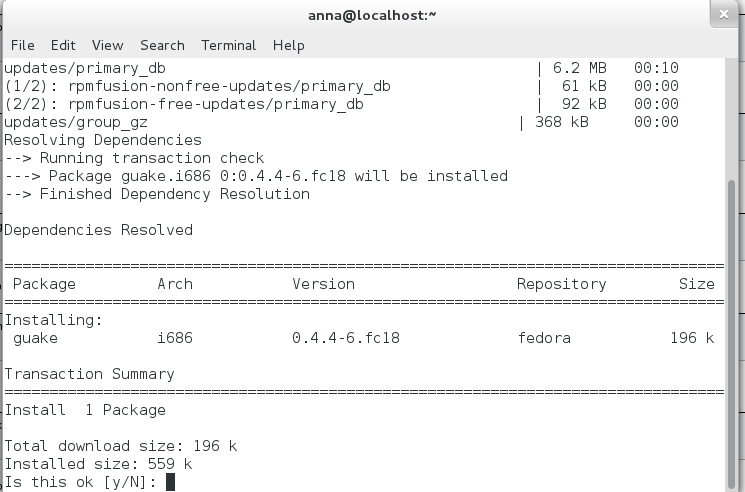 4) Once it is finished (see it says “complete!”) press f12 and you will see your Guake command line interface come down from the top of your screen. Press F12 again, and will slide back up again. Try this a few times. And hit enter. Press F12 to minimize, and see your autostart window. Click on “add” and type in guake in the first two boxes. Save it, and reboot your pc in your normal way. This entry was posted on Monday, February 18th, 2013 at 1:58 pm	and is filed under Uncategorized. You can follow any responses to this entry through the RSS 2.0 feed. You can leave a response, or trackback from your own site.